Vetra Nyx‘s Loyalty Mission Means and Ends is available upon reaching the Main Mission Hunting the Archon. 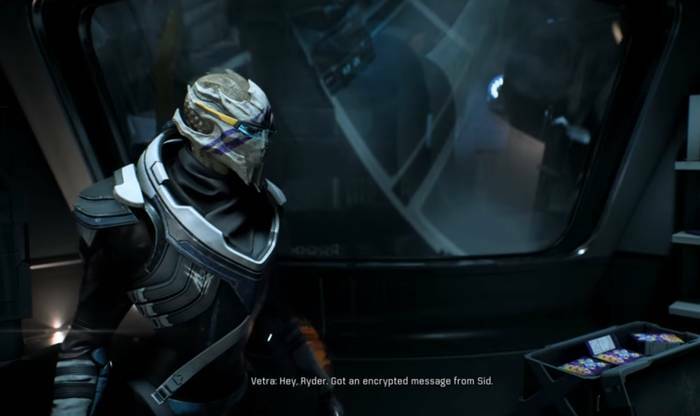 When you’ve completed the Main Mission A Trail of Hope, Vetra will email you of news about her sister Sid. Head to the supply room and talk to Vetra. 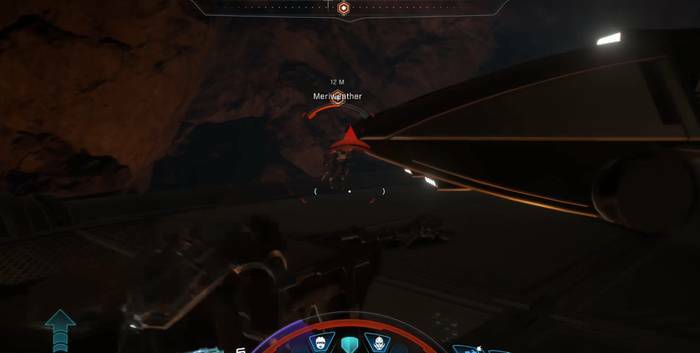 After the conversation with Vetra, travel to the Remav System and drop on moon H-047C with Vetra in your squad. 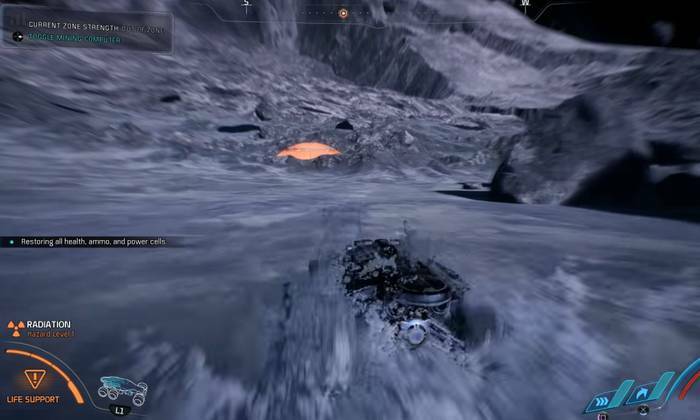 Once you’ve landed, hop on the Nomad and drive southwest towards the Idriya crater where a lunar base is situated. The lunar base is encased in radiation, so you’ll have to enter through the main door. 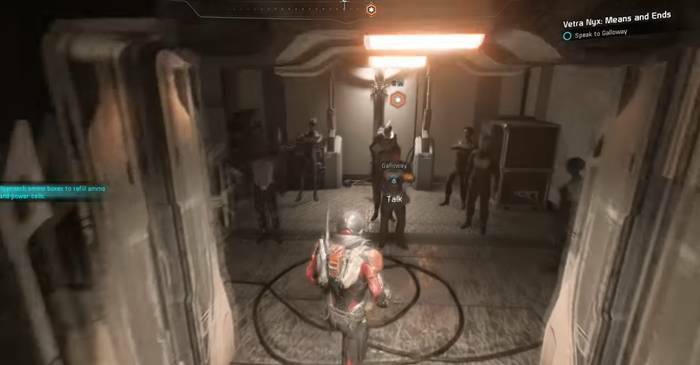 Once you enter the base, a cutscene will ensue. You’ll fall into a trapdoor as you scout the area. 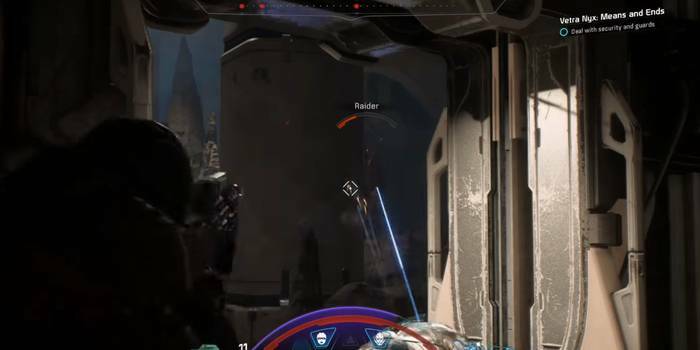 When you regain control of Ryder, you can look around and explore the prison for a bit. You can talk to Vetra and ask her a few questions about your predicament, as well as what she knows about Meriweather. You can also talk to Galloway for some more information. Head down the stairs and examine the door at the end. You’ll soon be contacted by a mysterious ally who offers to help you escape. Approach the generator on the other end of the room and scan it for Research Data. Afterwards, activate it. Head back upstairs and scan the cables on the ground near the stairs as well as the power conduit further ahead. Pick up the power conduit there and head back down to the generator. Use the power conduit on the generator to open the door. After heading in the next area, follow the quest marker and drop down to the lower platform below. Go to the room on the right and wait for the colonists to gather there. When the colonists have gathered in the room, use the camera to see the hostiles coming through the area you just passed. When the door opens, be prepared to engage some Raiders. As soon as you come out of the door, the enemies will notice you so manage the well. After taking care of the guards, talk to Galloway again. 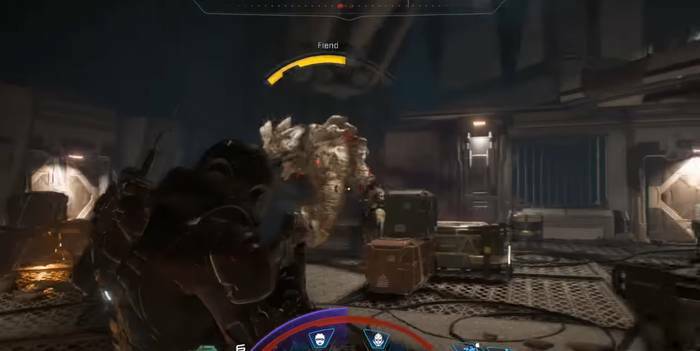 You’ll soon find out that the mysterious ally is Sid, Vetra’s sister. Follow the quest marker again towards the Mess Hall. When you approach the big door on the bridge, you can have Sid hack into systems to cause a disruption. Afterwards, check the security cam to see the enemies patrolling the mess hall. Afterwards, you have a choice of what kind of disruption you want Sid to do. You can choose to tell Sid to blow up the generator in the middle of the room to damage some enemies. Another would be to tell her to open the workshop to get some items inside. It’s up to you to decide which suits you. You can also just tell her to do nothing. Whatever your choice is, you’ll need to fight through the enemies in the Mess Hall. There will be some Raiders and Sharpshooters among the enemies so use cover to your advantage. After taking out the enemies, head for the quest marker towards the Menagerie. Note that there will be another security cam at the door of the Menagerie. As you look in the security cam to get a view of what’s awaits you. There will be some Arknid locked in cages in the room as well. When you get inside, prepare to engage some more Raiders. Make good use of the cover around the area to weave in and out of enemy fire. As most of the Raiders are killed, a Fiend will appear. 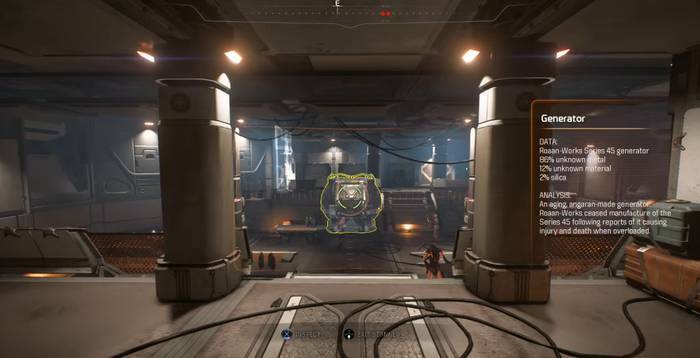 You can use the catwalk to make the fight easier (as the tight space will give the beast very little room to proceed). After killing the Fiend, follow the quest marker towards the workshop. Don’t forget to loot the Fiend when before you leave the room. When you approach the room to the worskhop, there wil be another security cam. You’ll again be able to tell Sid what to do to make your assault easier. You can ask her to blow up the engine inside, gas the room, disable the Hydra armor or just do nothing. After you’ve made your decision, head inside and take out the enemies. As you head for the door, a cutscene will ensue. Enemies are on to Sid in her position. When you regain control again, follow the quest marker and take out the guards and some Adhi on the way. Use the pillars on each side to peak out of cover and shoot when you can at the turrets above. You can also just run to towards the security console to have the turrets in your control. When you reach the area at the end of the quest marker, a cutscene will play. Meriweather has Sid, so you’ll need to take her out. She has a grenade that she threatens to detonate. 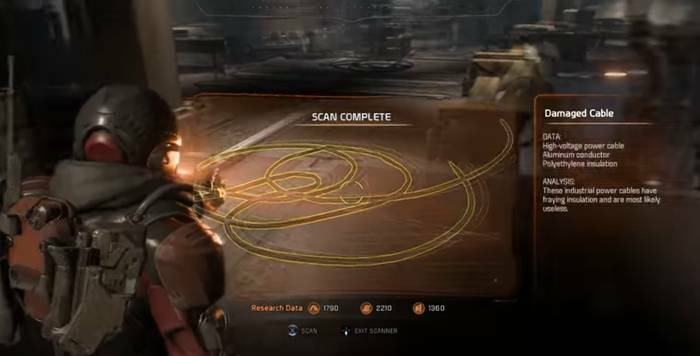 When she asks you to drop your weapons, agree then watch out for the reaction command on the lower-right to shoot her for Sid to survive. During the fight, Meriweather will be aided by several of her lackeys which include Raiders, Agents and Anarchists. The quest marker will be on Meriweather herself who you need to kill. The area has plenty of cover that you can use, so use them to your advantage. After you’ve defeated Meriweather and her forces, talk to Sid and listen to the conversation. You’ll need to occasionally offer input, but the end of the mission will always end in the two sisters bidding goodbye (temporarily) to each other. I can’t get back on the tempest because of the planet’s radiation? Know how to fix that?